This week, sixty people living within a mile of the Hardscrabble Wind Farm in upstate New York filed suit against the manufacturers of the turbines, owners of the project, and consultants who prepared environmental assessments. Since the new lawsuit is apparently aiming to collect damages from the wind farm owners, rather than challenging the project’s operating permits, it takes a line of attack that’s hard for me to get behind, because of its need to show negligence. As I prepared my post on the lawsuit, I found myself reflecting on the larger context within which today’s wind farm noise controversies are taking place. What follows is an AEI Commentary that grapples with the difficult and contentious process we are in the midst of, and AEI’s place within that process. In particular, I’m troubled that the noise consultant who did the sound modeling is a named defendant (not only the company, but the staff acoustician as well). 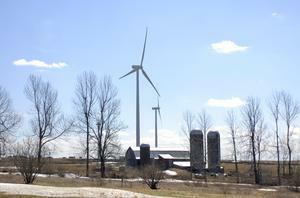 Sixty people who live within a mile of the Hardscrabble Wind Farm in Herkimer County, NY, have sued the operators of a 37-turbine wind farm that began operating in early 2011. Initial press reports suggest that the suit does not aim to shut the wind farm down, but to receive damages payments based on a litany of specific impacts, ranging from noise-induced headaches and sleep disruption to reduced productivity of livestock. The complaint as filed is available here, which details the specific impacts claimed by each plaintiff; many include loss of enjoyment of outside activities on their land, and inability to open windows due to noise; some include loss of income due to noise (including as a voice teacher), and some note behavior changes in domestic and wild animals (one notes that bear, deer, turkeys, and grouse no longer frequent his land). No specific damage amount is requested. It’s likely that any attempt to shut the wind farm down would be difficult if not impossible, since the project is operating under validly obtained permits. In recent months, Iberdrola, which manufactured the turbines in the Hardscrabble project, has been experimenting with a new Noise Reduction System after noise monitoring indicated that the turbines occasionally broke the 50dB town noise limit. I don’t like to say “I told you so,” but this AEInews post from autumn 2011, published after the first public complaints about noise at Hardscrabble, is well worth re-reading, as it includes a lot of detail about the sound levels projected in the project’s planning documents. As I noted there, this is just the sort of project that has become more problematic in recent years, “aiming to thread a very difficult needle, as they site turbines amongst hundreds of home sites, using noise standards that are pushing the edges of what is tolerable to residents who value the local peace and quiet.” While local noise standards allow turbines to be up to 50dB at homes, what stood out here was the noise contour maps, which showed over a hundred homes in the 40-45dB zone, and quite a few more in the 45-50dB zone (about half of these close homes were host families). As it turns out, it seems that here, as elsewhere, a significant proportion of those hearing the turbines at around 40dB are indeed being bothered by the noise. This is becoming a recurring theme at wind farms in the northeast (including Ontario) and the upper midwest, as well as in Australia and New Zealand. The root of the problem is that noise levels long widely accepted as tolerable for other sources of community noise are triggering complaints in a significant minority of residents near wind farms. As wind farms move from wide-open spaces of the west and into closer proximity with large numbers of rural homeowners, noise issues are on the rise (though still not occurring at many wind farms, and likewise, not bothering everyone even where problems arise). As longtime, very mainstream, acoustical consultant David Hessler recently noted, in a Best Practices document compiled for the National Association of Regulatory Utility Commissioners, “the threshold between what it is normally regarded as acceptable noise from a project and what is unacceptable to some is a project sound level that falls in a gray area ranging from about 35 to 45 dBA (Ldn: full 24-hr average sound level). Citing the classic Pedersen, et al studies, he notes “relatively high annoyance rates of around 20 to 25%” among residents living in areas with project sound of 40-45dB. He thus currently recommends a mean (Ldn) sound level of 40dB at residences in most cases, or 45dB “as long as the number of homes within the 40 to 45 dBA range is relatively small.” (For more on this Hessler guidelines document, see AEI’s overview of low-frequency noise research, available here) While Hessler’s approach may have helped at Hardscrabble, we don’t have solid information on what the full day-long average sound levels have been there. Neither the noise modeling beforehand or press reports of the post-construction monitoring include the averaging time used; with the monitoring finding the project generally under 50dB, it’s possible that daylong averages, including times when the wind isn’t blowing, were below 45db, or possibly even 40dB. In any case, those recommendations were published nearly a year after Hardscrabble began operating, and two years after the final acoustical assessments were completed. Since the new lawsuit is apparently aiming to collect damages from the wind farm owners, rather than challenging the project’s operating permits, it takes a line of attack that’s hard for me to get behind, because of its need to show negligence. Instead of distracting this post with thoughts on this, I’ve just posted an extended commentary in which I address this question of negligence within the context of the fundamental and widespread reassessment of the noise impacts of wind farms that is underway within the industry, the acoustical engineering community, and the public. If you find that AEI’s coverage of sound-related environmental issues is useful, unique, or otherwise of value, please consider making a donation this fall. I’ve been asked to present at two key conferences this fall and early winter, and AEI’s normal budget doesn’t cover travel, food, and hotel expenses. In late November, budget permitting, I will attend the 9th Wind and Wildlife Research Meeting, where my poster presentation will provide the meeting’s only overview of ongoing research and policy work relating to the effects of noise on wildlife. A couple weeks later, I’m off to Orlando for Renewable Energy World North America, where I’m co-hosting a session and doing a talk on the various ways that the wind industry is working to understand and address wind turbine noise concerns. Next week, I head to the Society of Environmental Journalists conference in Lubbock on my own dime; I’m exploring the possibility of returning to my roots as a freelance writer, in part to seed acoustic ecology ideas into broader public awareness. A few hundred dollars in donations this month will make a huge difference in making these conference trips possible. Please consider contributing to this year’s AEI outreach budget!